Can We Really Measure Habitat Condition From Space? It’s very hard to make sensible choices without sensible information. When it comes to actions around changing land use and its ecological impact though, this is often what we are forced to do. If we want to reduce the impact of human activities on natural ecosystems, we need to know how much change has already occurred and how altered an ecosystem might be from its “natural” state. Two heads are often better than one in decision making. 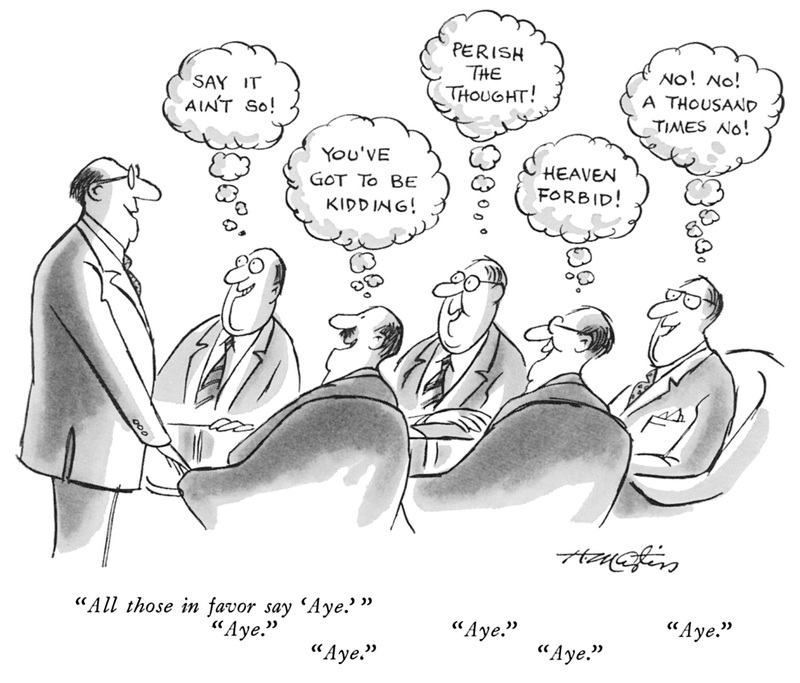 Several heads might have an even higher probability of being better than one. However, people in a group often have different modes of thinking or problem solving, alternate reference frames, subjective biases and varying levels or domains of expertise. How do we harness these messy thought processes and channel them for effective decision-making for biodiversity management? Cover image for issue 3.4 © Dennis Paulson. Our latest issue covers an impressive array of subjects: from metabarcoding (with associated presentation), to population genetics and population monitoring (with video explaining a microphone array system). Modelling and monitoring dispersal also features heavily with four articles, one of which is accompanied by a video for a novel telemetry system to track wild animals. 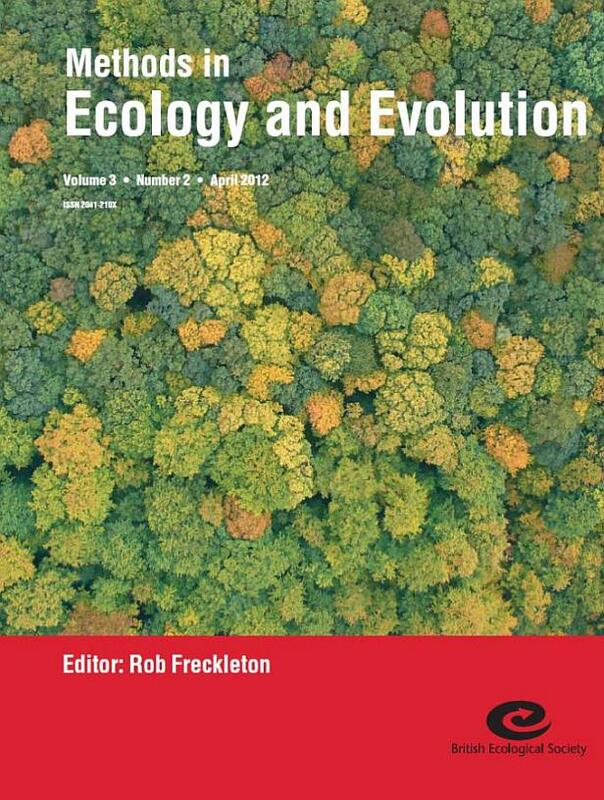 Articles also include topics such as transient dynamics, a review on hormone assay, phylogenetic comparative analysis, stable isotopes (featuring our cover article), plant physiology and finally, statistical methods. Stable-isotope ratios measured in migrating animals have proven to be of great value in understanding migration. For example, when a dragonfly emerges from the water, the isotope signature in that water body is fixed in its wing tissues, which thus provide information about its geographic origin. 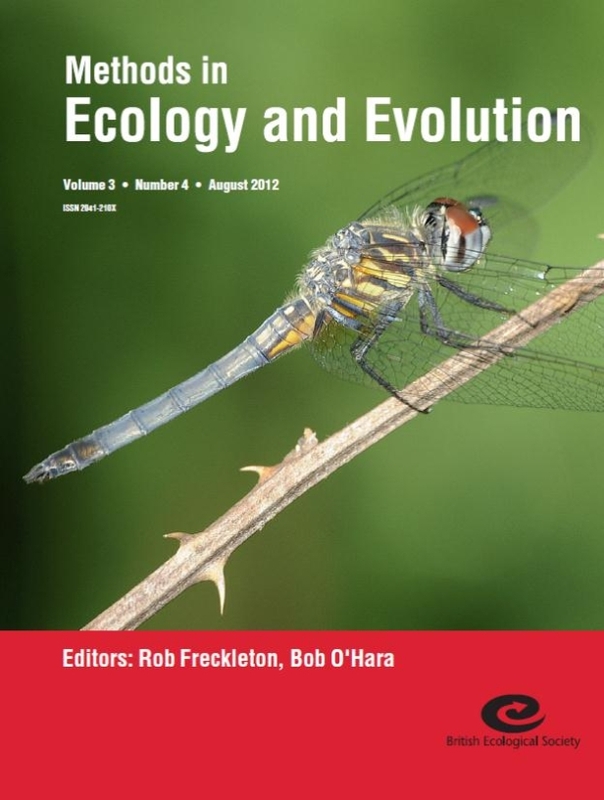 In A dragonfly (δ2H) isoscape for North America: a new tool for determining natal origins of migratory aquatic emergent insects, Keith Hobson, David Soto, Dennis Paulson, Leonard Wassenaar and John Matthews compared the isotope value from dragonfly wings of known origin with spatially explicit isoscapes based on water isotopes in precipitation. The relationship was strong, confirming the value of the method to study dragonfly migration. One of the species used in the analysis was Pachydiplax longipennis. This individual was photographed at Red Slough Wildlife Management Area, Oklahoma. Photo © Dennis Paulson. Issue 3.3 contains an amazing number of extra features: three videos, one podcast and one Powerpoint presentation. 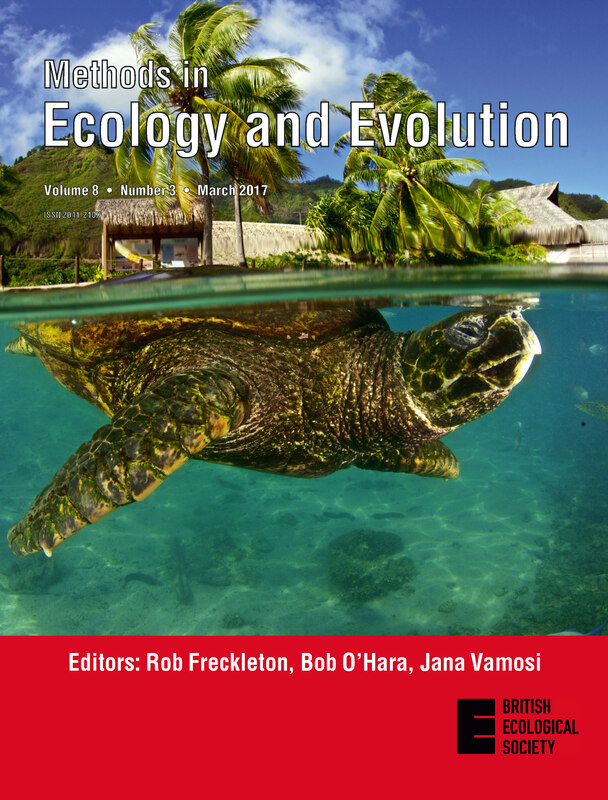 The topics in the issue range from DNA barcoding, surveys, measuring diversity, population and movement modelling and includes five free applications. Recently developed light-weighed tracking devices for positioning through light intensity pattern (‘geolocation’) have begun to greatly improve our knowledge of animal migration. However, the analysis of geolocator data is impeded by many factors potentially affecting light levels and thus, ultimately the determination of positions. Herein, weather and vegetation are major factors altering the light regime experienced by the animals. The picture shows a Common Rosefinch (Carpodactus erythrinus) featured with a 0.5 gram geolocator device. In Geolocation by light: accuracy and precision affected by environmental factors Simeon Lisovski and colleagues demonstrated the effect of weather, topography and vegetation on the measurement of day/night length, time of solar midnight/noon and the resulting position estimates using light measurements from stationary geolocators at known places and from geolocators mounted on birds. A perennial worry for anyone building models for the real world is whether they actually represent the real world. If the whole process of finding and fitting a model has been done well, the model will represent the data. But the data is only part of the real world. How can we be sure our model will extrapolated beyond the data? 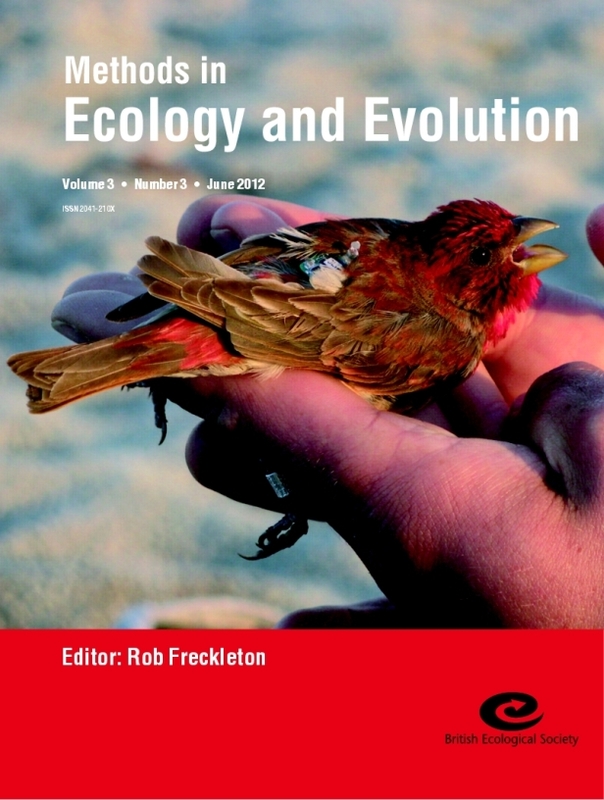 With topics ranging from phylogenetic analysis to statistics and distribution modelling, conservation, citizen science, surveys, genetic and demographic models to avian biology, our issue 3.2 should be of interest to most ecologists and evolutionary biologists. The issue also contains 5 free applications. This very high-resolution image of a beech-dominated forest in central Germany was taken by an unmanned aerial vehicle (UAV) at 250 meter above ground. In this photograph one can clearly recognize individual tree crowns and even smallest gaps. UAVs are increasingly used for ecological surveys because they provide extremely fine resolutions and thus allow the identification of previously undetected object details. Furthermore, UAVs can be considered as very cost-effective tools for the acquisition of data that can be used also very flexibly. In Assessing biodiversity in forests using very high-resolution images and unmanned aerial vehicles Getzin, Wiegand and Schöning tested the hypothesis that gap-structural information on aerial images can be principally used for the ecological assessment of understorey plant diversity in forests. The authors demonstrate that spatially implicit information on gap shape metrics is indeed sufficient to reveal strong dependency between gap patterns as a filter for incoming light and plant biodiversity. The study highlights that understorey biodiversity can be actively controlled by the spatial quality, and not just quantity, of tree removal. Thus, even under the same quota of tree harvesting, the promotion of complex and irregularly shaped gaps may be beneficial to foster biodiversity in forests. They will be soon available on Early View. This paper is accompanied by a podcast. Follow this link if you use a Mac to access the podcast.